In scorched trails of exhaust, US F/A-18 fighter jets and French Rafales take off and land at a frantic pace, all from the same US Navy aircraft carrier. 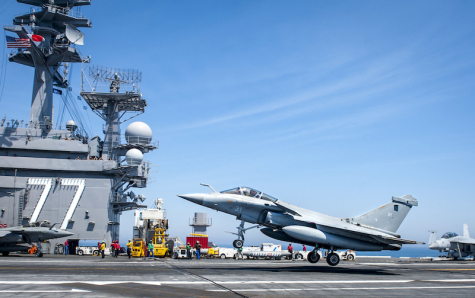 Since France's only aircraft carrier, the Charles de Gaulle, is undergoing a major renovation project until autumn, French pilots have been invited to hone their skills on one of the US Navy's 11 carriers. After a month of training on shore in Virginia, more than 300 crew from the French airborne group -- pilots, mechanics and flight deck staff -- have just joined the USS George H.W. Bush in the Atlantic. Twelve Rafales and a Hawkeye surveillance aircraft are with the crew on their ten-day deployment. With the George H.W. Bush twice the size of France's carrier, "it's up to us to adapt," says French Commander Vincent Isorce. On the Charles de Gaulle, it is impossible for planes to land and launch at the same time but that is the name of the game on the US ship. "This sport is not exactly for everybody," laughs a French pilot. In this deafening and perilous universe, everyone communicates with hand signals and raised fists. The flight-deck crew dresses in shirts colored for their missions: supply (purple), armament (red), safety (white). Yellow is for those who direct the aircraft. Nigel, an American, shows a bit of a dance move as he gives the "go" signal to a pilot. "I put a little of my style in all this," he laughs. "We are more sober," says Bruno, a French lieutenant who heads the Charles de Gaulle flight deck. 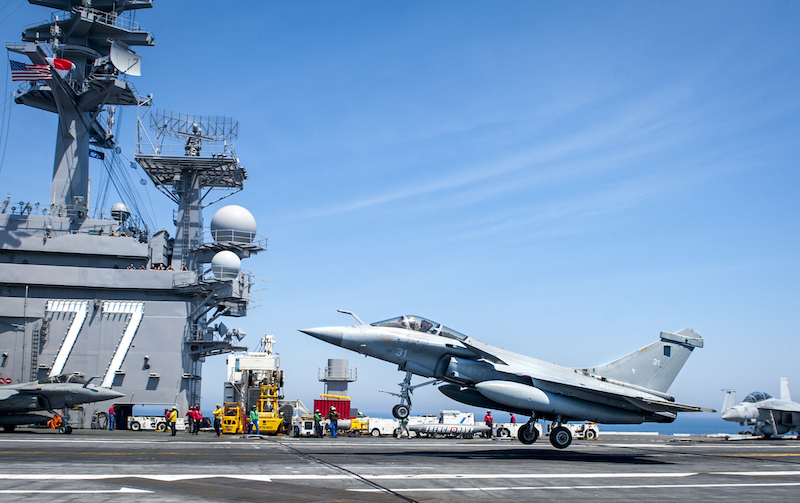 Although the two naval forces have years of joint operations behind them, particularly in the Middle East, this is "our first opportunity to work with the French on a flight deck," said Captain Sean Bailey, commanding officer of the George H.W. Bush. "It's been a great exercise so far. The way we've integrated pretty seamlessly is remarkable."